As Israel’s vicious attack claims more lives, Gaza’s infrastructure now lies in shambles, including the handful of nonprofit venues that made cultural life possible. Even before the invasion, frequent Israeli incursions, factional fighting, and a dwindling economy made for conditions in which art could barely exist. Yet with the determination that has defined modern Palestinian art for decades, artists in Gaza have continued to create, establishing artist associations and collectives and organizing frequent exhibitions both at home and abroad. A look at some of Gaza’s seminal artists reveals an artistic tradition that has survived years of conflict while contributing greatly to Arab culture. Born in Lydda in 1930 and forced to live in a refugee camp in Khan-Younes in 1948, Ismail Shammout was one of Palestine’s leading modernist painters. He organized his first exhibition in Khan-Younes in 1953 and lived in exile throughout most of his career, residing in Kuwait, Jordan, and Lebanon with his wife and colleague, Palestinian painter Tamam al Akhal. Often incorporating local folklore and history in portraits of women and children amidst scenes of expulsion and conflict, his monumental compositions and expressionist style became an important part of Palestinian visual culture, influencing generations of artists seeking to articulate their collective narrative. In addition to creating an impressive body of work and exhibiting across the region, Shammout produced Art in Palestine (1989), one of the first English-language texts on Palestinian art. Returning to Lydda after a 50-year absence, Shammout found his ancestral home occupied by Israeli settlers. The experience prompted him into creating a series of large-scale paintings with the hope of having it on permanent display in Palestine. “Palestine: the Exodus and the Odyssey” (1997-2000) contains some of his most memorable work — several mural-size canvases chronicling the Palestinian existence from Al Nakba to the Intifada with the visual prowess and historical magnitude found in the work of artists he admired, such as the Mexican Muralists. 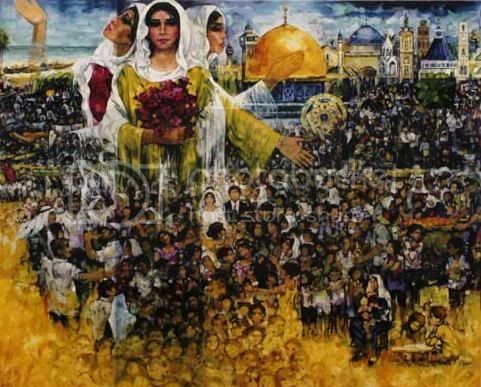 In Life Prevails (1999), a woman stands as an anthropomorphic representation of the Palestinian spirit — defiant and stoic above dozens of children while the mosques and churches of Jerusalem and shores of Gaza are shown in the background. In an inscription accompanying the work Shammout wrote, “The Israeli occupation was oppressive and ruthless. But we struggled to survive, to assert our presence, to preserve our traditions, and sustain our dreams. . . .” Shammout died in 2006, just days before Israel’s assault on Gaza and Lebanon, which devastated the neighborhoods near his Beirut home. The pen and ink drawings of Abdel Rahmen al Mozayen have become synonymous with Palestinian liberation struggles. Born in Kubyba in 1943, al Mozayen was a resistance fighter with the PLO and produced a number of political posters in the 1970s and 80s, iconic works that incorporate a unique combination of embroidery, ancient history, and stylized figures. Using the complex symbolism found in Palestinian embroidery to communicate steadfastness, his references to Canaanite heritage testify to the ancestral roots and longevity of Palestinian art, an element that is paramount to combating the co-option of local culture by Israelis and the near erasure of historical evidence by the occupation.1 Simultaneously, his employment of embroidery is significant — with the forces of occupation often clamping down on the display of flags and other material associated with the resistance, the Palestinian art form evolved into an intricate coded language of signifiers used as an act of defiance. Al Mozayen’s mother was an expert in the field. 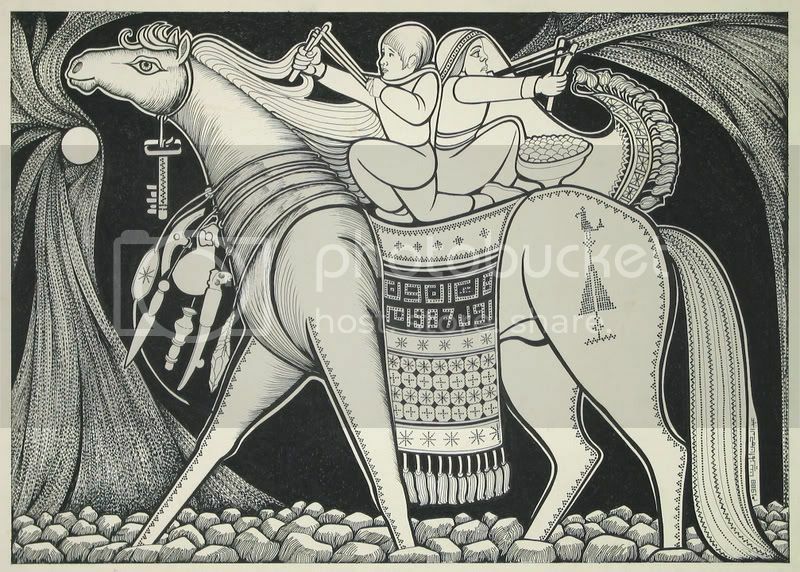 In Children of the Intifada (1988), the artist depicts two young children dressed in traditional Palestinian garb sitting atop a horse. The horse is adorned with an embroidered tapestry that reads “December” in Arabic and 1987 in English — the month during which the first Intifada erupted. From the horse’s bridle hangs a key, a familiar symbol for Palestinians: forced out by Israeli forces in 1948, many took the keys to their homes with them, expecting their expulsion to be temporary. The children have slingshots in their hands and a supply of stones nearby, a reference to the rock-throwing youth who were essential to the uprising. In mid-journey, the horse takes the children over a bed of rocks, perhaps suggesting the Jordan River as they cross it to liberate Palestine or a metaphorical road that is paved with the very means of their resistance. In contrast, the pensive and melancholic paintings of Fayez Sersawi underscore the psychological as well as physical effects of the occupation. Working to document the brutal tactics used by Israeli forces, he paints images capturing the daily experiences of Palestinians under widespread violence. 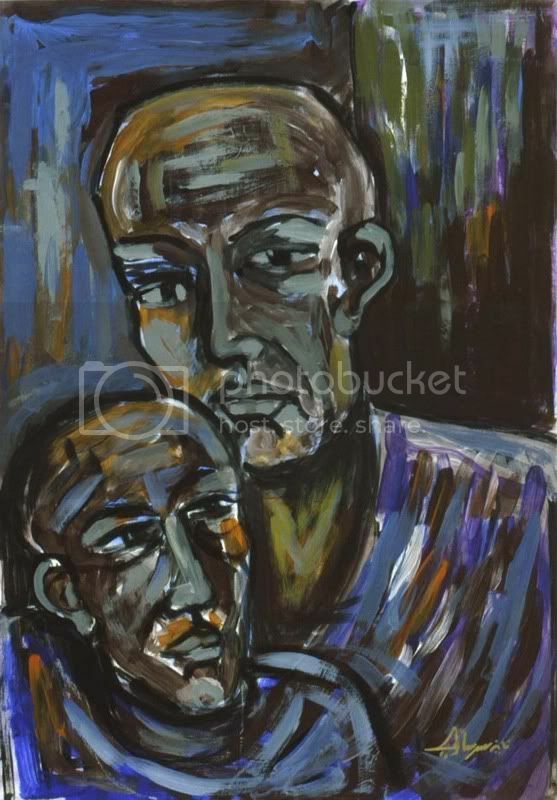 He has created such works as Two Men (2001), an introspective portrait of two figures, presumably a father and son. The positioning of the men, as they lean against each other, occupies the foreground, the center of the composition, leaving little room for an identifiable setting. Instead, the same expressionist brushstrokes that detail the age and wear of their faces appear in the background, unifying the figures with their surroundings. Rendered with aggressive markings that suggest chaos, the violence of the background blends into the bodies of the figures as if it were consuming their entire beings. The intimacy of Sersawi’s subjects is also of interest, as it resembles that of Christian icon painting. Rooted in early examples of icon painting near such sites of pilgrimage as Jerusalem — an observation brought to light by painter and scholar Kamal Boullata — much of contemporary Palestinian art can be understood within this artistic practice. Resembling compositions of the holy mother and child, the artist’s iconization of Palestinian men under siege is a bold take on the tradition with weighty political inferences. Sersawi has also greatly contributed to art education in Gaza. Using a YMCA facility outfitted with the equipment of a university-level classroom, he has taught dozens of artists, many of whom are now actively taking the reins of the cultural scene. Today, this new generation continues the movement formed by these visionaries. Unlike the Western model, in which art markets, for-profit galleries, and prestigious museums determine what is shown to the public and thus shape the production of art, the Palestinian art scene, which transcends Israeli checkpoints, the separation wall, and the continuous annexation of land, has relied on a dynamic community-based system of nonprofit galleries and art spaces that remains in touch with the everyday political realities of its surroundings. Artist organizations play an important role in providing a much needed environment for the creation and development of art through public events and education. Two leading Gaza organizations of young and emerging artists are Eltiqa Group and Windows from Gaza. Boasting a variety of artists working in photography, sculpture, new media, and painting, these groups regularly produce exhibitions and workshops open to the public. Among the eleven members of Eltiqa Group are painters Rima al Muzayen, whose colorful compositions explore the experiences of Palestinian women, and Mohamed Dabous, who, in addition to creating striking abstract ink and pastel works on paper, teaches visual arts at Gaza’s Al Aqsa University. In 2008, Eltiqa hosted a number of noteworthy events for its members, including the solo exhibitions of Rima al Muzayen and Dina Matar at the French Cultural Centre and a group show of Palestinian art featuring Abdel Nasser Amer at the Rashad Shawwa Cultural Centre. Outside of Gaza, Eltiqa was part of an impressive lineup of events such as “Without Preparing — From Gaza,” a joint exhibition with artists from Windows from Gaza at Makkan House gallery in Amman, Jordan, and “Morceaux Choisis Gaza,” a group show at the Université Paul Sabatier in Toulouse, France. A number of Windows from Gaza members work in video, installation, photography, and painting at the same time, such as Basel al Maqousy, an art instructor at the Jabaliya Rehabilitation Centre who was recently featured in the AM Qattan Foundation‘s inaugural London exhibition “Occupied Spaces,” and Shareef Sarhan, whose art comments on the destruction of Palestine under the Israeli occupation. Sarhan has been also photographing the damage, turmoil, and civilian toll of Israel’s current assault, one that appears to have no end in sight. The impact of Israel’s latest act of barbarity on Gaza’s cultural infrastructure has yet to be fully assessed, as reports are just beginning to document art centers that have been hit or are surrounded by bombardment. So far bloggers are circulating that the Rashad Shawwa Cultural Centre has been bombed, while the Institute for Palestine Studies has confirmed the destruction of the newly founded Gaza Music School, located in a building owned by the Palestinian Red Crescent, which was hit in the first wave of shelling on December 27. The school taught children aged seven to eleven, the majority of whom were girls. The fate of such important venues as the French Cultural Centre, the Municipality of Gaza’s Arts and Crafts Village, Al Karam Center for Cultural Arts, or the YMCA in Gaza City cannot be determined at this point. If these centers were to sustain little or no structural damage, their futures are still uncertain, as the cultural workers whose dedication they depend on are sure to be facing dire circumstances. 1 Samia Halaby, Liberation Art of Palestine, 2001. For more information visit: <www.shammout.com>; <www.eltiqa.com/index.html>; <www.artwfg.ps/home.htm>; and <www.artschoolpalestine.com>. Maymanah Farhat specializes in modern and contemporary Arab art. Her collected writings can be viewed online at <maymanahfarhat.wordpress.com>.